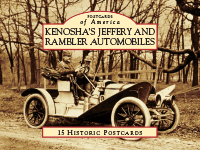 This newest book by America's most prolific old-car authority covers a topic never before available in book form- the early Rambler and Jeffery cars beginning with the first prototypes to the final Jeffery's built by Nash. 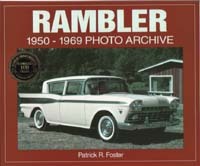 Loaded with rare photos of Rambler and Jeffery cars and trucks, as well as many previously unpublished photos, each more than 100 years old, taken inside the factory. Softbound, $21.95 plus shipping. Books will be shipped beginning April 23rd. Postcards will be shipped beginning April 23rd. 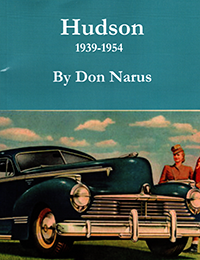 Another great new book from Don Narus, this one covers the fabulous Hudson cars and trucks of 1939-1954, with photos, specifications and production numbers. Softbound, 117 pages, more than 200 photos. $21.00 plus shipping. 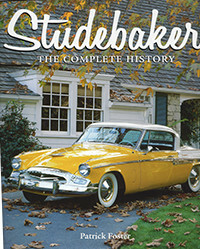 In this brand new book you'll read about one of the most iconic American performance pioneers of all time- the legendary Studebaker Golden Hawk. We are accepting pre-orders for this limited print run. The book is at the printers and will ship as soon as it arrives in our facility. DON"T MISS IT!!! Hardbound, 88 pages, great photos $29.95 plus shipping. 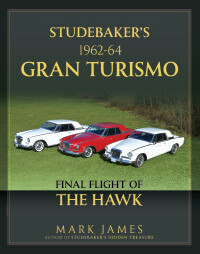 An all-new and very authoritative book about the Studebaker Gran Turismo Hawks. 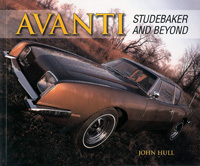 Gorgeous full-color photography and a well-written text from one of the hobby’s greatest Studebaker writers. Release date is expected to be late-October to mid-November. We are accepting pre-orders now. 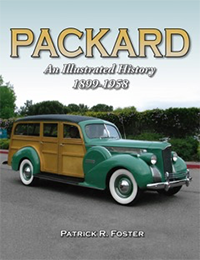 In this new, full color history of Packard veteran old-car writer Patrick Foster details the glory of the fabulous Packard automobiles and analyses what caused the company to fail. Softbound, glorious color and b&w photos, $32.00 plus shipping. Will be autographed at your request. $32.00 plus shipping. Will be autographed at your request. 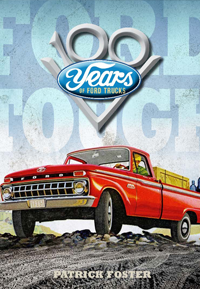 2017 marks the 100th anniversary of Ford Motor Company trucks, and this all-new volume by award-winning author Pat Foster details the complete history as well as all the top models of light-duty, medium-duty, heavy-duty and severe-duty Ford trucks, and vans. Hardcover, quality throughout and loaded with beautiful color photos. $39.00 plus shipping. Will be autographed at your request. 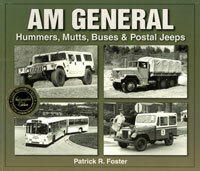 In this exciting new book author Patrick Foster recounts the full history of one of America’s oldest companies and the fine trucks it made. The story begins with the birth of International trucks and continues on to the present day. This book will debut in December 2015; buy now and get a special pre-publication price on a special edition signed and numbered by the author- Just $35 plus shipping- That’s $10 off the announcement price! 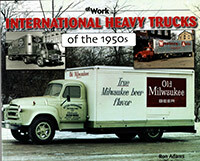 This new book is all about the terrific heavy-duty International trucks offered during the 1950’s. Each page offers one or two large format photos that provide excellent detail, along with a descriptive caption. 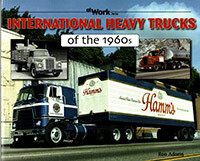 Another new book is this terrific volume about heavy-duty International trucks offered during the 1960’s. Each page offers one or two large format photos that provide excellent detail, along with a descriptive caption. 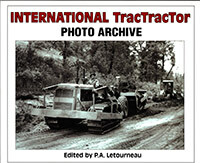 This unusual book is all about the tough and capable International TracTracTor vehicles. Each page offers one or two large format photos that provide excellent detail, along with a descriptive caption. 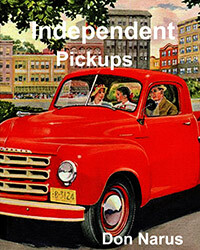 By Don Narus- a brand new book by a leading authority on independent brand vehicles, this one focuses on the pickup trucks produced by the independents. 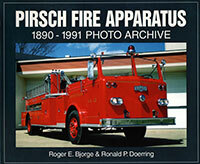 This new book covers the other vehicle maker from Kenosha, Wisconsin- firetruck maker Pirsch. For over 100 years this esteemed manufacturer produced high-quality fire apparatus for customers around the world. Each page offers one or two large format photos that provide excellent detail, along with a descriptive caption. Softbound, 126 pages. $28 plus shipping. Out of print for many years, Rooty Toot Rambler is a children's book about an abandoned Rambler that is found and rescued by two little dogs. Delightful! Softbound, $12 plus shipping. This great little book is a reference book to the fabulous Pontiac Fiero. 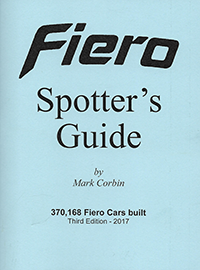 Pocket sized and loaded with production facts, figures and specifications, this is an invaluable tool for Fiero owners and especially for those in the market for a Fiero. This new edition, published in 2017, contains much new information not seen in earlier editions. Softbound, 80 pages. $16 plus shipping. We've been distributing books by Don Narus for many years and they're always popular. 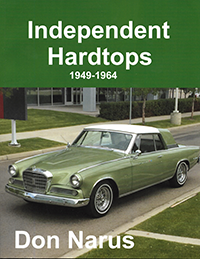 In this new book Don covers the hardtop models produced by the Independent automakers- Studebaker, Hudson, Nash, Willys etc. from 1949 to 1954. Softbound, a big 158 pages long and packed with great photos. $21 plus shipping. 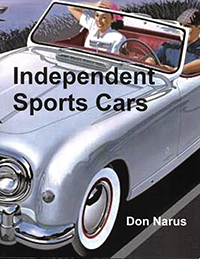 In this, his latest book, Independent enthusiast Don Narus covers the sports models built by AMC, Nash, Crosley, Studebaker, Hudson, Delorean, and Kaiser. Softbound, 108 pages $21 plus shipping. This classic by Chris Zinn is once again available and with a new low price. 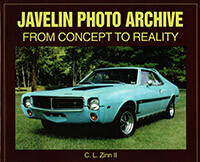 Covering the Javelin from concept models to all the production models, it’s a great photo history. 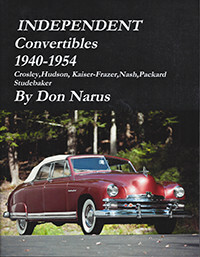 The newest book by Don Narus, this is a look at the lovely convertible automobiles produced by America’s independent automakers: Packard, Nash, Hudson, Studebaker, Crosley etc. Lots of specs and information, a lively text and a nice low price tag. Just $22 plus shipping. 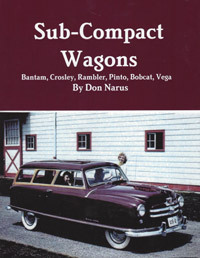 Another nice book by Don Narus, this one tells the story of the station wagons built by America’s independent automakers. Well-priced and chock full of good info- Just $22 plus shipping. 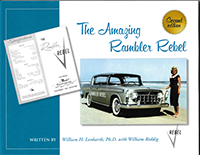 In this newly updated and larger edition of his classic work "The Amazing Rambler Rebel' Dr. Bill Lenharth adds new information only recently discovered along with page after page of new photos. You love it! 154 pgs, softbound, $34.95 plus shipping. 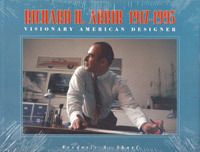 Visionary American Designer Richard Arbib is probably best known for the work he did for Packard, including the award-winning Packard Panamerican show car that led to the production Carribean models. 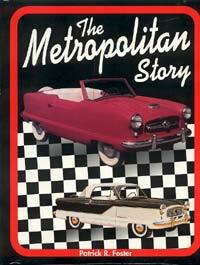 Arbib also designed the Nash Metropolitan Metro Gnome, as well as several other show cars, and worked for a while at GM. His ideas were often futristic and far out, and this neat book shows them in bright color. America's number one Jeep historian. This all-new book tells the complete history of Jeep, from its beginnings in 1941 and right up to the present. Loaded with info and fascinating insights. Hundreds of photos, color and b&w, many of which have never before been published. A quality hardbound book, 192 pages. Will be autographed by the author. 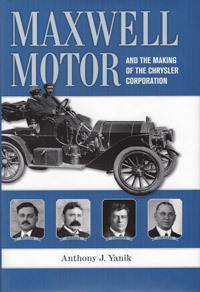 This is an absolutely fascinating history of Maxwell Motor Company, the highly successful independent automaker that went on to become Chrysler Corporation. This is one of the most enjoyable books we've read. Hardbound, 189 pages, nice B&W photos. 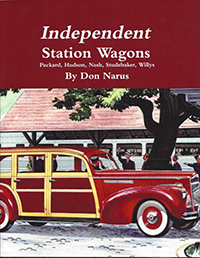 By Don Narus tells all about the small station wagons produced in America from 1938 to 1980. Loaded with photos and lots of information, and well priced. 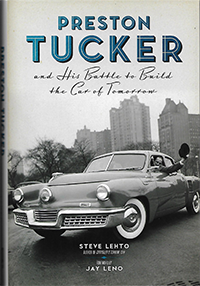 This unusual book is not a history of the Tucker automobile; rather it's a history of Tucker and several other men who tried to bring innovation and excitement to the auto industry, both in the US and in Europe. Delorean, Tucker, Wankel and Borgward are the better known innovators in this concise tome. Plenty of color and B&W photos. 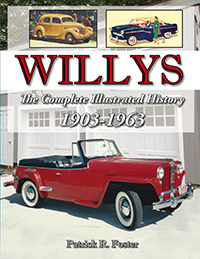 The first book to cover the history of the Willys company along with the fine automobiles it produced. 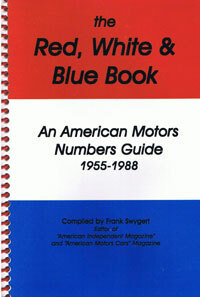 Covers Overland and Willys cars and trucks, including Jeeps, from 1903 to 1963. Softbound, 132 pages, approx 150 color and b&w photos. 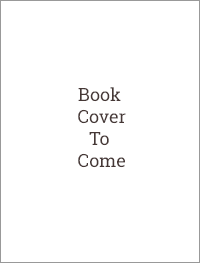 Cover price is $36.95 but we are offering a Special Autographed Edition at a special pre-publication price of $34, and each book will be autographed by the author. $34 plus shipping . Books will be shipped in May. This new book is about one of the most successful Studebaker cars ever and the man who made it so. 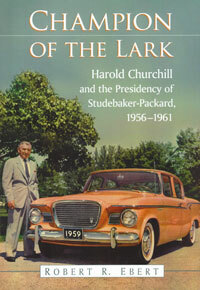 Harold Churchill was president of Studebaker-Packard and he's the man who pushed through the Lark program. In this fascinating book author Robert Ebert tells the behind-the-scenes story of that exciting time span 1956-1961. Softbound 188 pages. Lots of B&W photos. Hupmobile was one of the most-interesting of the Independent automakers that came into being in the early days of the auto industry. Hupp rose to great heights only to fall victim to the same market forces that killed so many other firms. 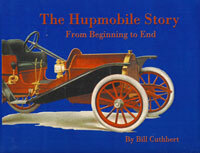 But Hupmobile was a survivor, cashing out of the car industry and becoming a very successful investment company. In this great new book you'll read the fascinating story of one of the most exciting car companies ever. Hardbound, 200 pages. Lots of great B&W photos. Here we have a good clean copy of a rare, long out-of-print book by Hudson expert John A Conde. 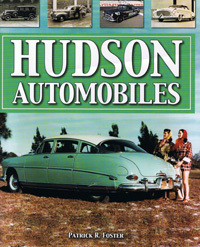 This is without doubt the BEST book on Hudson cars that has ever been produced and is highly prized by collectors. The book's dust jacket is clean but has a couple small tears, the binding is clean and tight and overall in great shape- one of the best we've seen. You're going to cherish it. 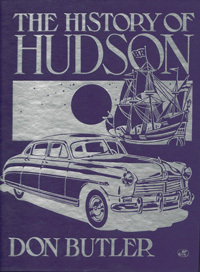 Butler was an employee of the Hudson Motorcar Company and in this book he catalogues every Hudson model for every year- a remarkable accomplishment. Includes photos of all years as well. A rare and long out-of-print book, we have a couple very good copies here on hand. 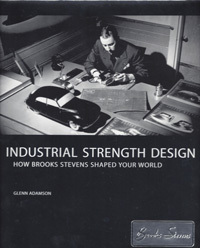 This great book is an authorized biography of industrial designer Brooks Stevens, known for his design work for Studebaker, Willys and American Motors, as well as his development of the Excalibur automobile. Includes his automotive work as well as his work for Evinrude, Harley-Davidson, Allis-Chalmers, Kaiser-Frazer, and many more. 219 pages and beautifully illustrated. This book is out of print and hard to get but we have a small number of excellent volumes on hand. 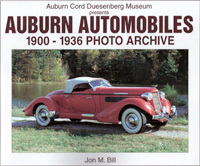 Presented by the Auburn Cord Duesenberg Museum, this new book tells the history of the Auburn car in words and pictures. The photos are the biggest aspect of the book; they cover the entire page so that details can be seen clearly. A rare treat about a rare car, the book is softbound, 126 pages. 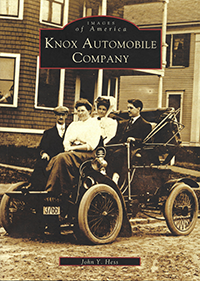 Presented by the Auburn Cord Duesenberg Museum, this new book tells the history of the Cord automobile in words and pictures. The photos are the biggest aspect of the book; they cover the entire page so that details can be seen clearly. A rare treat about a rare car, the book is softbound, 126 pages. Foster also details the things that went wrong that led to AMC's demise. Hardcover, printed on high quality stock and loaded with color photography, much of which has never been published before. Fascinating! $35.00 plus S&H. The book will be autographed by the author at your request. 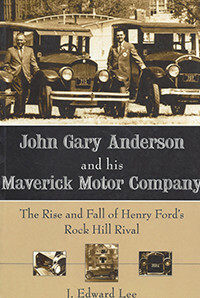 This softcover book details the life of one of America's greatest automakers- the Hudson Motorcar Company. Loaded with insights and information and packed with high quality photos. A brand new book about the Crosley automobile and the unique man who created it. 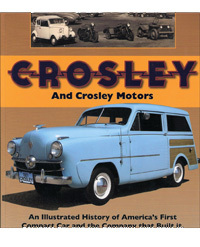 This all-new book features details about Crosley Motors and includes color photos of many of the cars, trucks and motorcycles it built. 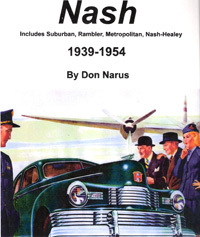 Great new book by Don Narus covers Nash during its growth years of 1939-1954 and covers Nash, Nash-Healey, Rambler, Suburban and Metropolitan. A mix of narrative and specifications, this book is well-price and well recommended. Softbound, 130 pages. 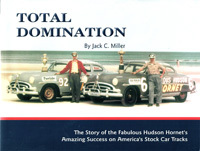 This great book tells the story of the Fabulous Hudson Hornets during their amazingly successful racing years of 1951-1954. In those days Hudson was almost unbeatable, often winning the first five places in a race. As the title says, they totally dominated NASCAR for a four-year period. Written by Hudson expert Jack Miller. Softbound, a big 238 pages, great photos. Checker lovers- we're as crazy about Checkers as you, and we highly recommend this book. 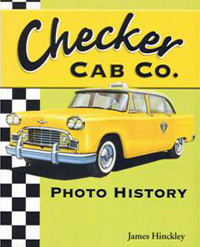 It's the best we've ever seen on the history of Checker the company and Checker cars. Lots of really excellent photos showing details and models you probably have never seen before. Softbound, 120 pages. Don't wait until its out of print! 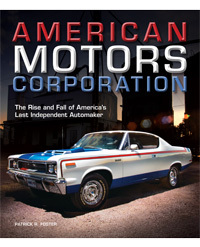 This new book by veteran auto writer Patrick Foster- America’s spokesman for independent cars- tells the full story of Kaiser-Frazer’s struggle to succeed in an industry that killed so many competitors. One year after announcing plans to enter the automobile business with an all-new car Kaiser-Frazer production began. The cars were an immediate hit. Thousands lined up to see and buy the new Kaiser and Frazer cars. In time K-F introduced hardtops, sedans, convertibles, an impressive fiberglass sports car and a line of low-priced compact cars. But competition eventually proved overwhelming and Kaiser-Frazer production ended. The company itself survived by purchasing Willys-Overland, and building Jeep vehicles instead of cars.The Kaiser-Frazer story is a tale of exciting ideas, bold plans, and thwarted ambition. A heartbreaking yet uplifting allegory of men and automobiles during the most exciting era the industry has ever known. 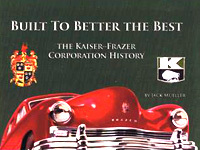 This great new book details the entire history of the mighty Kaiser-Frazer automobile company. Loaded with detail and hundreds of terrific photos, this is the most comprehensive look at K-F to date. Author Jack Mueller is a recognized authority and the result is clearly a labor of love. It's hardcover, with 192 pages printed on quality paper, and loaded with facts, specifications and so much more. You'll love it! 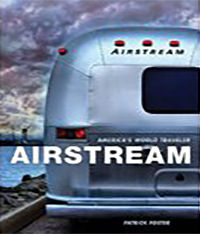 Highly recommended for all AMC enthusiasts. 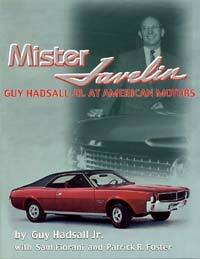 Guy Hadsall Jr.a t American Motors Muscle car fans call him Mister Javelin, because during his years at American Motors Guy Hadsall was given the responsibility for naming the new Javelin, and arranging the gala introduction of both the Javelin and AMX to dealers. Softbound, 96 pages, 80 photos, many rare and not previously shown to the public including Javelin, AMX, Rambler and Nash. New edition published 2007. 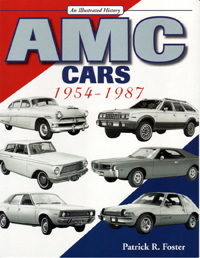 This book by award-winning AMC historian Patrick foster celebrates AMC cars from 1954-1987- and also the 1988 Eagle! An all-new text plus over 300 photographs- many never before published. 160 pages, softbound. 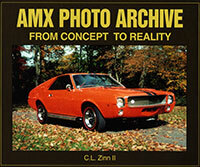 AMX & Javelin Gold Portfolio- This new book is a collection of articles taken from vintage automotive magazines from 1968-1974. 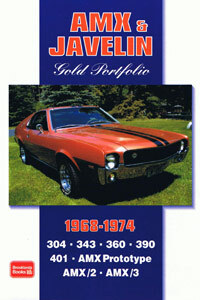 Each article covers road tests of new Javelin and AMX cars. A nice collection of vintage magazine articles taken from Motor Trend, Road & Track, Car Life & others from 1956 to 1969. 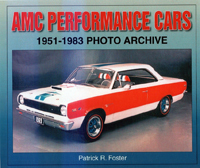 Patrick Foster's classic history of American Motors, this book has become a much sought after classic. 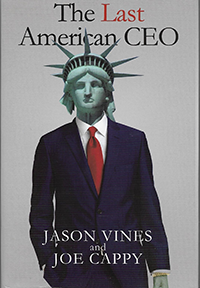 Covers the corporation's life from 1954-1987. Hardbound, 304 pages, over 230 photos. This book has been out of print for many years but we recently were able to acquire a small number of copies. 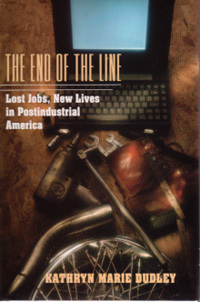 Lost Jobs, New Lives in Postindustrial America- by Kathryn Marie Dudley- An evocative & powerful look at America in transition, The End of the Line tells the story of the closing of the former American Motors plant in Kenosha, WI. Written by an assistant professor of American studies at Yale, this look at the social consequences of the shutdown of Kenosha is not for everyone, but students of AMC history will want to add it to their collections. Hardbound, 223 pg. 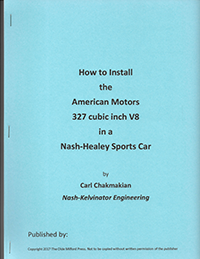 The title says it all; this is a how-to guide to installing the AMC 327 into a Nash-Healy. What's great about this booklet is that it was written decades ago by Carl Chakmakian, Nash Engineer and former head of AMC's racing efforts. 15 pages, softbound, reprint of an earlier work. $22 plus shipping. 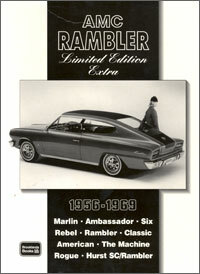 Covers the modern Rambler from 1950 to 1969. A pictorial history by Americas great AMC historian. Includes many previously unpublished photos. 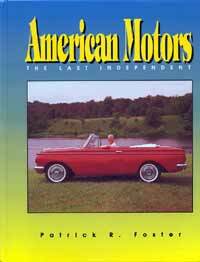 Rambler, AMC and Nash enthusiasts love this book! Softbound, 126 pages, over 125 photos. 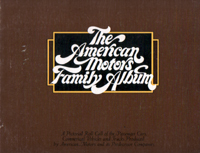 1902-1976 Softbound album published by American Motors, features pictures of Rambler, Jeffrey, Hudson, Nash, Essex, AMC models from 1902-1969. Very rare hardcover edition $94.95 plus s&h. 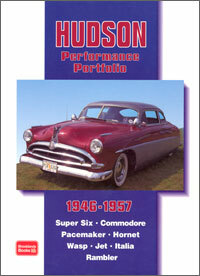 This new book by Patrick Foster highlights the performance cars produced by Nash, Hudson, Rambler and AMC. 128 pages approx 120 photos. 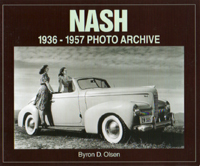 This book is a photo history of the Nash cars from 1936 to the last year of production, 1957. Each page is filled with a large size photo of a Nash model, showing the sort of detail and clarity you just can't get with smaller photos. Restorers especially like this book. The full model range is covered to the extent possible, and the text provides additional information. 125 pages, approx 120 photos. 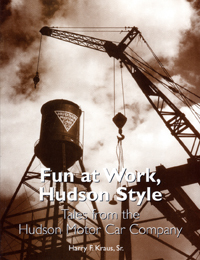 Fascinating new book written by a former employee of the Hudson Motor Car Company gives an often-humorous view of the inner workings of Hudson. The best book ever written about the Met is back in print and available right now! Beautifully illustrated with b&w and color photography, authored by America’s greatest AMC writer. A collection of vintage articles from Motor Trend, Road & Track, Car Life & others. Softbound, 128 pgs. Crosley fans- this is an exciting new book about Powel Crosley, his brother Lewis, and the cars, trucks, radios, and everything else they made. 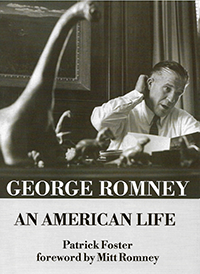 Co-authored by a Crosley grandson, there is a wealth of information on family background, business history and products. Some pretty good pictures too! Hardbound, a big 504 pages! Due to our volume buying power we're able to offer this at an excellent price. This brand new book from King Midget expert Bob Vahsholtz is a history of the KM in words and pictures. Lots of great photos! Softbound, 86 pages - $14 plus shipping. 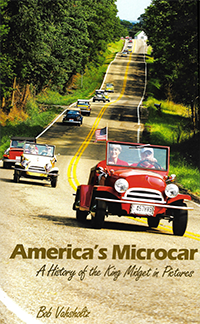 The first and only history of the King Midget, America's greatest fuel economy champ (90 mpg!) and smallest dream car. Well-written, compelling history loaded with info, facts and 100's of photos. Rare! 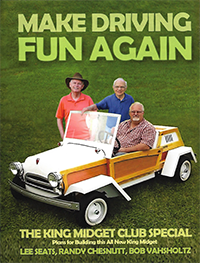 In this fantastic book you'll learn how to build the new King Midget Club Special automobile from scratch for about $2000! Based on the King Midget Model 2, the Club Special has been engineered to provide greater room and comfort, more power and speed, along with easy home assembly. Big, thick and very comprehensive, we are the proud publisher of this and other fine books about King Midget. Spiral bound- $42 plus shipping. 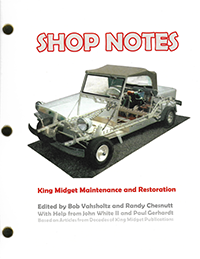 This big thick book is a collection of many years of repair and restoration articles and guidelines written by the top King Midget guys in the world, all thoughtfully reproduced and categorized. 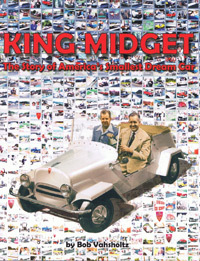 If you own a King Midget, or are planning to, you must have this book! Softbound and hole-punched so you can slip it into whatever binder you want, $42.00 plus shipping. 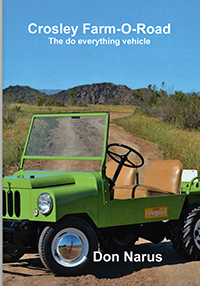 The newest Jeep book from Pat Foster, America's most prolific Jeep author! 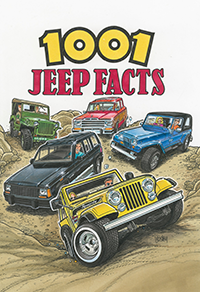 This book contains 1001 facts about Jeep arranged by model series; ie. Jeep CJ's, Wrangler, J-series, Grand Cherokee etc. Illustrated with many never before seen photos and jampacked with fun and useful information. Softbound, $26.95 plus shipping. What's this- a book of poetry? Olde Milford Press owner Patrick Foster is a native Vermonter and wanted to republish a book written years ago by a relative. 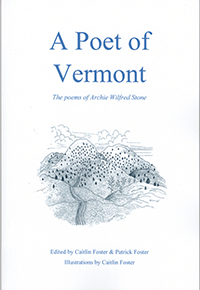 Playful, whimsical poems about the most beautiful state in new England, along with an epic-length poem about Vermont's Green Mountain Boys and the fight for Ticonderoga. Softbound, 75 pages, $17.95 plus shipping. This small book is a pure delight! Author Don Narus examines Crosley, along with the Crosley Farm-O-Road vehicles, and their successor, the Crofton Bug. As a bonus, Narus takes a look at the legendary AMC Mighty Mite four-wheel-drive military vehicles. Softbound, 60 pg. $11.95 plus shipping. This is a book that needed to be written! 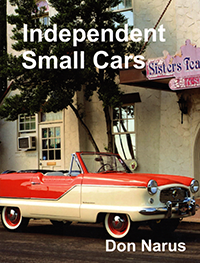 Author Patrick Foster examines the most important of the American Independent car companies, including Studebaker, Nash, Packard, AMC, Hudson, Kaiser-Frazer etc, but also includes many of the lesser-known firms, like Colt, Avanti, Checker, Crosley, Freeway, Glassic, Tucker, King Midget and many many more. Beautifully illustrated with rarely-seen photos! Softbound, $34.95 plus shipping.